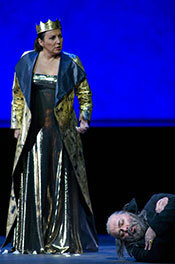 LEFT: Maria Guleghina as Abigaille, the adopted daughter of Nabucco (Paolo Gavanelli), from whom she has seized the crown. INSET BELOW: Giacomo Prestia as Zaccharia (shown here with the chorus of the Bayerische Staatsoper). Under the direction of Yannis Kokkos (who also designed the sets and costumes), the Bayerische Staatsoper has served up a lively, attractive, and modern production of an opera that was first prsesented in Munich's Nationaltheater more than 150 years ago. Paolo Gavanelli as Nabucco. The baritone, described by the opera company's Takt magazine as having an "Italian timbre and a German soul," specializes in dramatic characters. More than half of the roles in his career have involved Verdi operas. Maria Guleghina as Abigaille. The renowned soprano, a veteran of many Verdi operas, appeared in an earlier production of Nabucco in Verona. Giacomo Prestia as Zaccaria. Signor Prestia is a baritone of great presence whose credits include televised productions of Aida, La Sonnambula, and Tosca. Daniela Sindram as Fenena. Besides performances in many operas, the German soprano is a concert singer with a repertoire that ranges from Lieder to Bach Cantatas. Aleksandrs Antonenko as Ismaele. The young tenor began his career as a member of the Latvian National Opera Chorus in 1997, became a soloist within six months, and is now a veteran of the international opera circuit. The chorus of the Bayerische Staatsopera also deserves top billing; its members act as convincingly as they sing, and their collective performance as Hebrew prisoners in Nabucco is nothing short of stunning. Finally, Paolo Carignani, the production's musical director and orchestra leader, is worthy of note; Signor Carignani is both a Verdi specialist and the General Music Director of the Frankfurt Opera. Photos copyright © Wilfried Hösl.